While the worldwide market for mobile phones is growing rapidly, Apple is earning the majority of all profits despite only selling a small minority of the world's mobile devices. According to an analysis of top handset vendors' reported earnings by Horace Dediu of Asymco, the combined operating profits from all mobile phones remained relatively stagnant below $6 billion per quarter for years until the release of Apple's iPhone 4. Over the last two years however, mobile profits have skyrocketed, jumping from $5.3 billion at the start of 2010 to $14.4 billion over the most recent quarter. 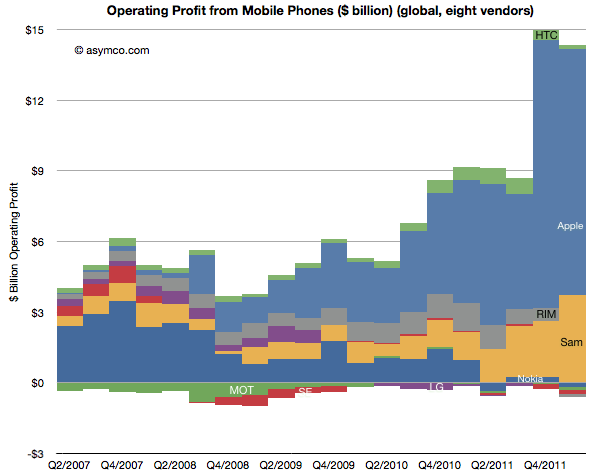 The beneficiary of that explosion in mobile profits has almost exclusively been Apple. Apart from Apple and its 73% share of mobile profits, Samsung has remained the only other major phone maker to continue capable of turning a profit in the industry since the release of the iconic iPhone, despite the voracious global demand for mobile phones, and in particular the highly profitable smartphone, which has seen its unit sales grow by 47%. When Apple introduced the original iPhone in 2007, the market leader was overwhelmingly Nokia, but Samsung, Sony Ericsson, LG, RIM and HTC were all profitable. In the last quarter, Nokia reported its first major quarterly loss of $1.2 billion, while former industry darlings RIM and HTC also reported dismal performance. Sony Ericsson, Motorola and LG have all failed to earn significant profits in the mobile business since 2009 or earlier. Dediu notes that Apple's recent surge in profits "were mostly carrier premiums for the iPhone 4S," and that mobile carriers "willingly hand over these premiums because the iPhone ensures a competitive advantage or preserves their customer base from churning. The calculations that go into a decision to range the iPhone are compelling enough that 250 operators made the decision (though, crucially, there are still 250 who have not)." He further observed, "the industry is rewarding those who can supply computers-as-phones which preserve the cash flows of what is essentially a trillion dollar data services business. Vendors which cannot offer this solution saw their businesses implode. At least on the high end." The site's review of mobile industry profits punches a hole in recent reports by a variety of market analysts that congratulated Samsung for shipping the most smartphone units, but also tears apart a theory by BITG Research analyst Walter Piecyk that suggested Apple was about to lose the carrier subsidies that have padded its bottom line over the past two years. Following Piecyk's note to investors early last month, Apple's stock dropped nearly 12% before recovering after the company reported blockbuster quarterly earnings. Apple shares currently remain at $581, significantly below the company's all time high of $644 reached in the days before Piecyk voiced his fears of an end to carrier's subsidy payments.